The Doodle & Crumb infant rocking horse has a stylised fabric print body and a super soft scrunchy faux suede mane and tail. Crumb is a fabulous toy bean horse which is located in the side pouch. There is also detachable foot plates. This luxurious kids rocker would make a great gift idea for toddlers! Measures: 64 x 35 x 52cm. 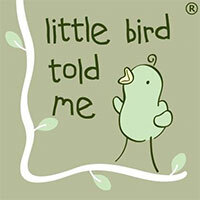 Brand: Little Bird Told Me. Location: Homfirth, Great Britain. Little Bird Told Me consists of a team of nursery specialists who are dedicated to making the World of little people and grown-ups that little bit more special. This uniquely different range consists of innovative infant rocking animals and horses together with a range of nursery accessories. All products come in a eco-friendly gift style packaging! With an industry that is awash with electronic toys that almost control how a child should play, Little Bird Told Me see the beauty in simple traditionally based toys that have the ability to capture a child's imagination and encourage explorative play. That's why all their products have interactive features, carefully considered by their designers, that stimulate and encourage free-play rather than dictate it and that are built to last. Toys today seem to last only as long as a child's attention span before they break or wear out! Little Bird Told Me believe in designing toys made to the highest quality so they can be passed down through the generations, not just the toy but the message of free play outside our cookie cutter world of hypnotic electronic devices! A big Cuckooland hooray to that!